If your live broadcasting software does not allow you to send track information, this functionality is ideal to provide listeners with information about the current playing show. It can also be used to mask the track information for sponsored events or relays. This feature is available on our Broadcaster, Station, and Gold plans. If you are on the DJ plan, you can upgrade via the billing settings page in your dashboard. 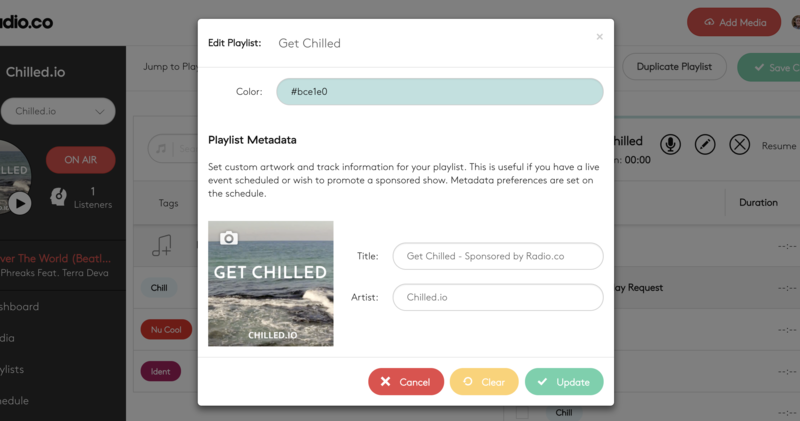 Playlist Metadata options are located within the Playlist editor (Playlists > Playlist Name > Edit). Once the Playlist Editor loads, click the Pencil icon on the right-hand section. This will bring up the playlist options window. On this pop-up window, you can rename your playlist and change the color. You can also provide playlist artwork, title and artist information. By default the Title is set to the playlist name (e.g. Get Chilled) and the Artist is set to your Station name (e.g. Chilled.io). To upload custom artwork click the Camera icon in the upper left of the artwork and select Upload. Choose a file from your computer, ensuring it is at least 600x600px and in JPG or PNG format. Any files uploaded that aren't square will be centre cropped. Please bear this in mind to prevent chopping any text off the cropped image. If you want to remove your playlist artwork you can do so by clicking the Camera Icon and selecting None. To edit the Playlist title and artist change them in the text fields on the window. Click Update to apply your changes, Clear to reset artwork and track information or Cancel to go back to the main playlist editor screen. To save the changes you have made, click the Save Changes button on the main Playlist editor screen. 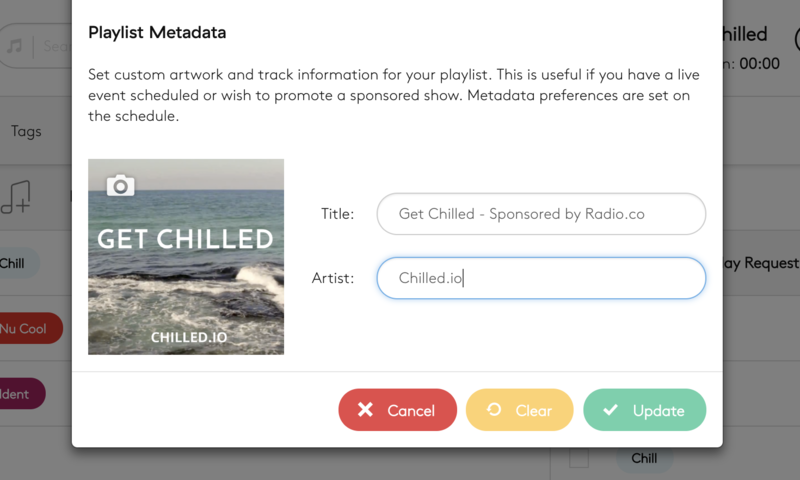 By default, Playlist metadata will apply automatically if your live broadcast contains no track information. As soon as the DJ sends track information via their software, or disconnects so your automated playlist resumes, standard track information will resume. Click the yellow Advanced button to show the advanced options on the right hand side. 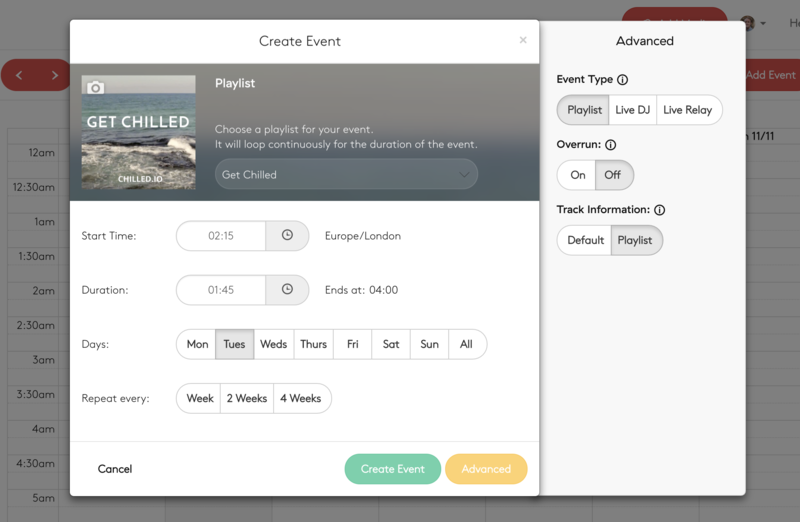 Under your event type, change Track Information to Playlist. Click the green Create/Update Event button to save your changes. When your event begins, the playlist metadata will be shown on Radio.co HTML5 players, Apps and Tunein.com if you have this integration enabled.